Massad Ayoob on "Just the FACTs": Episode 2. MINNEAPOLIS, Minn. – October 12, 2017 – In the second episode of “Just the FACTs,” author and instructor Massad Ayoob discussed a number of topics, including his new book, expert testimony, the 5-Point Checklist and more. At the end of the episode, Ayoob answered questions from the audience during an extended Q&A session. Like all “Just the FACTs” episodes, the interview was filmed with the new FACT™ Weapon-Mounted Cameras (WMC™). 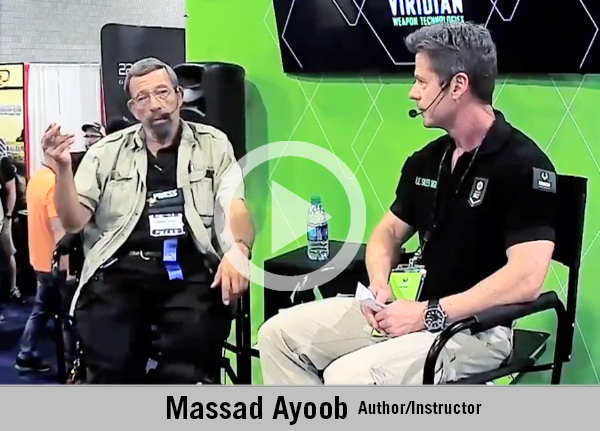 Massad Ayoob is a world-renowned firearms and self-defense instructor, business owner, author and knife designer. For over 40 years, he has trained law enforcement personnel and private citizens in combat techniques, personal defense, firearms and legal issues. He has authored several books and more than one thousand articles on related topics and has served in an editorial capacity for publications like Guns & Ammo, Combat Handguns and others. Ayoob frequently serves as an expert witness in trials where use-of-force or self-defense concerns are argued. He has also served as a part-time police officer in three departments. Viridian's "Just the FACTs" series was filmed during the NRA Annual Meetings in April 2017 with multiple FACT WMC™ cameras. Each segment features well-known industry leaders and manufacturer representatives. Topics range from personal protection, concealment and the Second Amendment to new products, market trends and current events. Each video has an "In the Chamber" side-bar graphic which outlines the topics covered. Viridian's proprietary INSTANT-ON® technology powers the FACT Duty™ cameras, and more information is available at https://viridianweapontech.com/fact/. Additional episodes will be released on a regular basis and can be found on Viridian's YouTube channel. Headquartered in Minneapolis, Minnesota, Viridian Weapon Technologies is devoted to applying cutting-edge technology to design compact, powerful self-defense products for the civilian, military and law enforcement markets. Viridian® is the leader in weapon-mounted technology and responsible for a number of firearm innovations including green and red laser sights, LED weapon-mounted illuminators and several shooting accessories including the Tacloc® Holsters. Viridian products are designed and built in the USA. More information is available at ViridianWeaponTech.com.